For several months, dozens of young adults across the archdiocese have been in training. They’re running mile after mile to prepare for the One America 500 Festival Mini-Marathon on May 3 in Indianapolis. They’re also in spiritual training because they hope running in the race, also known as the “Mini,” will raise awareness about vocations since tens of thousands of people participate in the marathon each year. They’re all members of the “Run for Vocations” team, a program initiated by Father Rick Nagel, archdiocesan associate director of vocations. And they’re asking that Catholics across the archdiocese join them spiritually in their effort by pledging prayers for every mile that they will run. Father Nagel and the other young adults on the team will wear a specially made T-shirt during the race. On one side will be the message: “Vocation … Everyone has one. What’s yours?” The other side of the shirt will list such vocations as the priesthood, religious life and marriage. With so many thousands of people who may see the shirts, Father Nagel thinks the vocation runners’ impact could be big. Victor Neff, a member of St. Mary of the Immaculate Conception Parish in Aurora, is already pondering that question as an archdiocesan seminarian. He will run in the Mini for the first time as part of the “Run for Vocations” team. 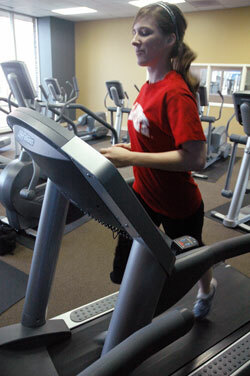 Julie Burns, 27, a member of St. Joan of Arc Parish in Indianapolis, is also on the “Run for Vocations” team. She sees it as a chance for young adult Catholics to strengthen their faith together. “I love the fact that I’ve asked family and friends to support me with [prayer] pledges,” Ritter said. “This alone has stirred up some great conversation and much-needed attention to vocations. John Demerly, a 34-year-old member of St. Susanna Parish in Plainfield, also has five children and is a member of the “Run for Vocations” team. While training for the Mini, he prays along with a recording of the rosary that he has on his mp3 Player. He hopes that being part of the team will set a good example for his children. “It is always my hope that at least one of my children considers the religious life,” Demerly said. “Certainly, this is God’s will more than it is mine so I will accept whatever he wills. The evening before the race, all team members will gather for prayer at a Mass scheduled to start at 6 p.m. The runners will receive a special blessing at the Mass. Catholics across the archdiocese, especially those who are making prayer pledges for the team, are invited to attend the May 2 Mass at St. John the Evangelist Church in downtown Indianapolis.